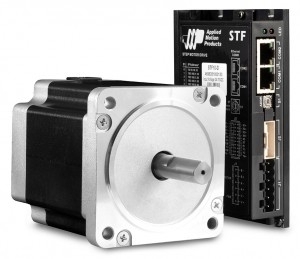 STF Stepper Drives are designed for optimal open-loop step motor performance and compatibility with your preferred industrial Ethernet or fieldbus protocol. Supported network protocols include industry standards such as EtherNet/IP, Modbus, EtherCAT and CANopen. We also offer our proprietary Serial Command Language (SCL) for efficient network communications over Ethernet (UDP or TCP) and RS-485. 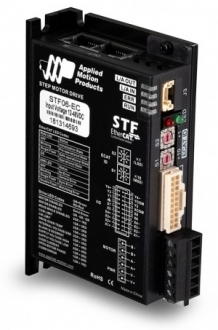 Continuing our tradition of developing stepper drives with advanced current control, STF Stepper Drives utilize an anti-resonance algorithm to optimize the torque and speed performance of the step motor. By reducing or eliminating resonance in the step motor, full torque is available to move the load. This translates to higher acceleration and deceleration rates, higher speeds, faster machine cycles, and ultimately greater throughput for your machine or process. 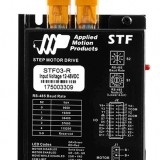 STF Stepper Drives are designed for accurate, open-loop control of step motors. To incorporate an encoder into your stepper system and take advantage of the encoder feedback functions we offer, see the ST Series Stepper Drives. For full closed-loop control of a step motor take a look at our StepSERVO products. The communication options available as standard are listed below. All STF drives come with two communication ports (dual-port) to enable daisy-chain connections of multiple drives back to the central processor, HMI or PLC. Don't see the network protocol you need here? Contact us to inquire about a custom drive to suit your needs. STF-R drives come with RS-485 ports for Modbus RTU or Serial Command Language (SCL) communications. STF-C drives come with CAN bus ports for use on CANopen networks and support DS402 motion profiles. STF-D drives come with Ethernet ports for Modbus TCP or Serial Command Language (SCL) communications. STF-IP drives come with Ethernet ports for use on EtherNet/IP networks. STF-EC drives come with Ethernet ports specifically for use on EtherCAT networks and support DS402 motion profiles via CANopen over EtherCAT (CoE). All STF drives feature the ability to run Q programs stored in non-volatile memory. Q programming provides a range of motion profiles, multi-tasking, math functions, conditional processing, data register manipulation, and more in a robust yet simple text-based programming language. All drive configuration and Q programming of STF Stepper Drives are done using the STF Configurator software. STF Stepper Drives come in three power ratings: 3.0, 6.0 and 10.0 A/phase (peak-of-sine). Together these power ratings cover all sizes, from NEMA 8 to NEMA 34, in our range of industrial-grade step motors. Visit the detailed product pages linked below to see the complete list of recommended motors for each drive.